Cinema Of Shadows is a full-throttle, unique journey that takes the concept of the conventional “haunting” to new territory. Well written, with a suspense that is palpable, West delivers a novel that strikes emotional chords and challenges our imaginations. The Woodfield Movie Palace has stained the community of Harmony, Indiana. From fires, murders, to suicides; its sorted history is about to come to an end with a wrecking ball. But, from within, an evil that precedes antiquity begs to differ. It plans and waits. Kim is a struggling college student who is doing her best to pass her classes and move on from a past of nightmares that still awake her. Most fans will remember her--and what set her on her path--from West’s short story The Bridge that appeared in his collection, A Skull Full Of Kisses. There is only one way out of this perpetual torture, and the answers she seeks: a Parapsychology class headed by a Professor with a past just as dark, and haunted as Kim’s. Professor Burke’s intent is to have his students collect as much data as possible from the Woodfield Movie Palace before demolition starts. As they do, what waits for them subtly extends its reach into the sleepy town with fingers that desiccate everything and everyone they touch. Even the doctors and the police become embroiled in the escalating chaos—and the humble people that comprise the town carry their suspicions on whispers. Kim and her class-mates friendships, relationships, and their inherent trust are put to the test, as a reality bereft of logic consume them. As the stakes rise with every pulse-pounding chapter, these bonds are stretched to their limits. Can they stand together and do what must be done, lest their home and life itself vanish like the people the Woodfield has consumed? 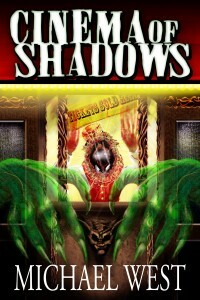 Cinema Of Shadows is a compelling novel that catches the reader off-guard. West begins with familiar territory and makes it his own, in all of its horrific glory as emotional chords are plucked...one by one. The real beauty of this novel is West’s unique approach to ambiguity. Each chapter raises the bar, as well as our emotions it elicits. As usual, West gives us a novel that snares us into a world eerily similar to ours, tickles our imaginations, and proves once again that his voice is rare and quite formidable. To find out more about Michael West, please visit his website. Ben Eads is a dark fiction author of short stories and longer fiction. His work tends to represent modern horror coupled with what he likes to call: “Imagination-tickling elements”. Ben is also a huge fan of dark fiction and dark movies. At the age of ten he wrote his first story. 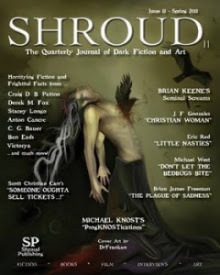 Taking writing seriously in early 2008, Ben Eads has published numerous short dark fiction stories in various magazines, anthologies, and E-Zines.